HOT TUB & SPA ENCLOSURES The perfect companion to the outdoor spa or hot tub The spa dome is the perfect companion to the outdoor spa or hot tub. 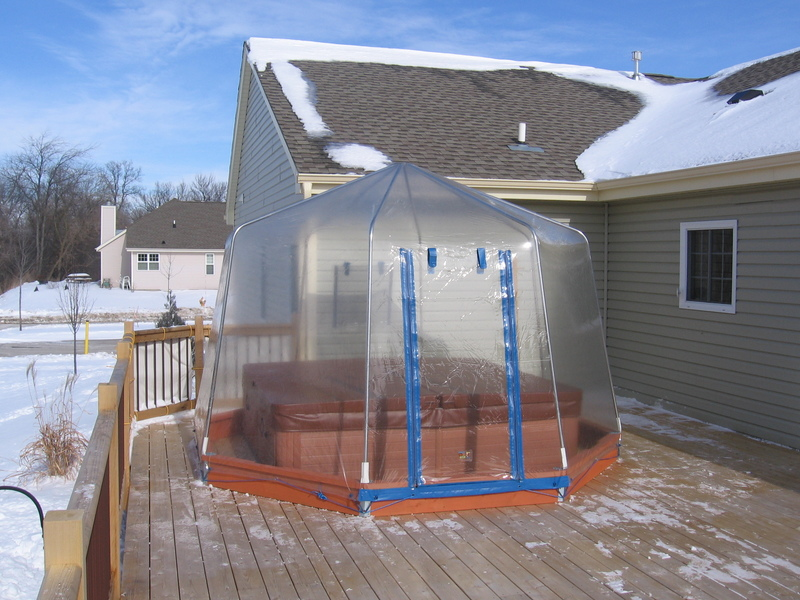 Your spa or hot tub is enclosed and completely protected from the weather. Spa domes come in 9’, 12’, and the 15’ sizes and are octagonal in shape. No tools required after the initial installation. The heavy 12 gauge vinyl cover is supported by a series of aluminum tubes. The crystal clear cover is electronically heat sealed to provide a tailored fit for every size. Each cover has one door opening with two heavy duty nylon zippers which are also heat sealed to the vinyl.